Students should bring their own machine that is in working order, or rent a machine from us for an additional fee. Basic Sewing Kit: Large Fabric Scissors, Seam Ripper, Small sewing scissors or thread snippers, extra Sewing needles, Pins, extra bobbins & Small ruler. Cancellation policy: No less than 24 hours notice is required for refund of class fee. Each month we will look at a different quilt block and learn the technique behind it. 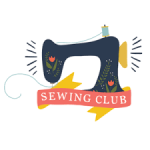 Students will learn basic sewing skills and terminology. Each class session will be spent making a small project that they can take home with them.